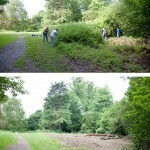 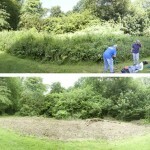 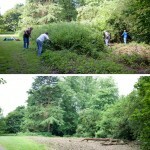 June 14th saw the working party continue clearing at the Circle; formerly the central focus of the whole parkland. 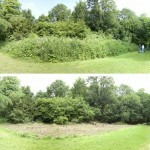 Last month we raised the tree canopy so that views of Kings Weston House were again revealed, and this month we returned to open up the central area where brambles and undergrowth threatened to engulf the whole space. 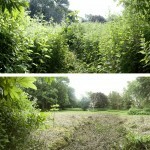 Once again it feels more open and views between the main avenues and paths are again possible. 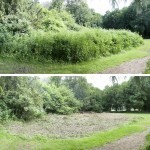 We are approaching the Council estates department to ensure that all our achievements this year are consolidated and a regular maintenance strategy implemented.